Obesity is a chronic disease affecting more and more children, adolescents and adults. Women with the circumference of 88 cm and men with the 102cm circumference are at risk of metabolic and cardiovascular problems of obesity are on more risk. There are many reasons of obesity like lack of physical exercise, more intake of alcohol, eating more of junk food, excessive intake of high-calorie food or changes in hormones. There are many potentially reversible causes of weight gain such as Hypothyroidism, Cushing’s syndrome, hypothalamic tumors or injury, insulinoma. Whereas drug treatment includes Tricyclic antidepressants, corticosteroids, β blockers, Estrogen containing contraceptive pill. Apart from this, Hypertension, Type 2 Diabetes, Sleep apnoea, varicose veins, polycystic ovary syndrome, depression, skin infections, gallstones are some of the complications of obesity. There are certain herbs which can treat obesity like Alfalfa, Thyme, Parsely, Oat straw, Sea wrack, Juniper berries, Gravel root, Horsetail, Con silk, Yarrow and Hydrangea can be used to fight from obesity. On regular basis, Drink 2 to 3 cups of green tea, people who drink 5 cups of green tea daily burn an average of 5% more fat than people who do not drink. Fruits like lemon, orange, tomatoes, sweet lime are much beneficial for weight loss. Include almonds, pumpkin seed, olive oil, and sunflower seed in your diet. Also you can take lime juice with honey. Take High fiber diet, cereals with milk and fruits in breakfast. Include Broccoli, carrots, beans and sweet potatoes in regular routine. Garlic contain Allicin which helps to reduce cholesterol, hence it is useful to treat obesity. 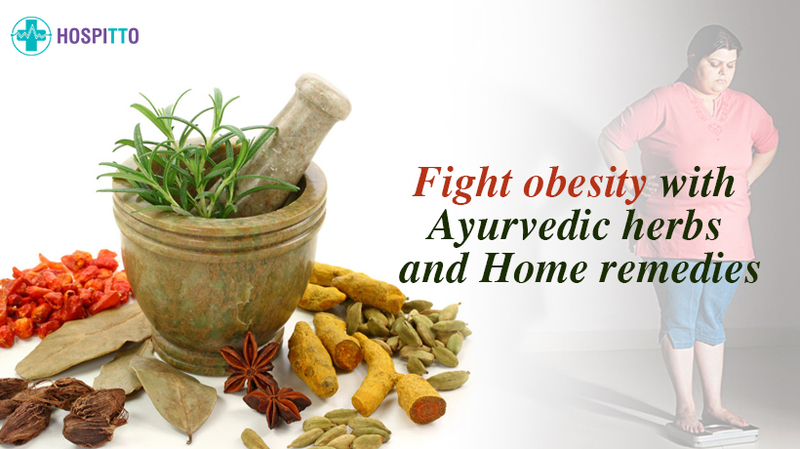 Before taking these Ayurvedic medicines, consult to an Ayurvedic Home remedies physician. Panchakarma: this should be taken in an Ayurvedic panchakarma centre and also, consult to an Ayurvedic physician before adopting any plan. Triphala: it has antioxidant, anti-diabetic, and anti-obesity effects and also it is very effective for weight loss. Amalaki: it is effective for cardiac problems, diabetes and oxidative stress.